1. William PICKERING married 7 March 1792 Kirby Grindalythe Hannah SMITH (daughter of John SMITH and Unknown UNKNOWN). 1.1. 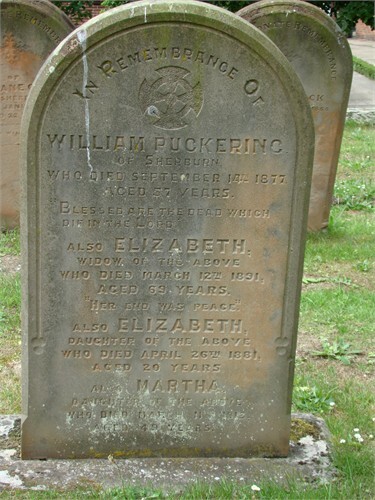 William PICKERING born West Lutton, baptised 17 May 1792 Weaverthorpe, died before 1851, married 28 November 1814 Butterwick Hannah BAKER (daughter of Joseph BAKER and Mary UNKNOWN) baptised 24 January 1785 Thwing. 1.2. Ann PUCKERING baptised 2 May 1794 Weaverthorpe. 1.3. Jane PUCKERING baptised 27 April 1795 Weaverthorpe, had children with Unknown UNKNOWN. 1.4. Elizabeth PICKERING baptised 16 March 1801 Weaverthorpe. 1.1.1. John Baker PICKERING baptised 14 January 1816 Weaverthorpe. 1.1.2. Eliza PICKERING baptised 23 March 1817 Weaverthorpe, married 18 March 1837 Great Driffield James BROWN. 1.1.3. Joseph Baker PICKERING laborer, baptised 15 October 1820 Great Driffield, married 1st 18 May 1842 Great Driffield Martha JENNISON (daughter of Robert JENNISON and Mary UNKNOWN) baptised 22 September 1822 Hutton Cranswick Cranswick, died September 1883 Driffield, married 2nd Asenath WOOD (daughter of Francis WOOD and Martha UNKNOWN baptised 6 December 1830 North Dalton. 1.1.4. Mary Ann PICKERING baptised 10 July 1823 Great Driffield, had a child by Unknown UNKNOWN, married 1846 Driffield Joseph PADLEY. 1.1.5. Maria PICKERING baptised 9 May 1826 Great Driffield. 1.1.6. Mary PICKERING baptised 8 March 1838 Great Driffield. 1.1.3.1. Ann Elizabeth PICKERING born c1841 Driffield. 1.1.3.2. Mary PICKERING baptised 22 May 1844 Great Driffield, had a child by Unknown UNKNOWN, married 1865 Driffield John BURTON. 1.1.3.3. Hannah PICKERING nurse maid, baptised 4 March 1847 Great Driffield. 1.1.3.4. Abigail PICKERING servant, baptised 21 June 1849 Great Driffield. 1.1.3.5. Jabez PICKERING baptised 7 November 1851 Great Driffield, died before 1854. 1.1.3.6. Jabez Baker PICKERING cattle man, baptised 13 April 1854 Great Driffield, married 1876 Driffield Susan CAREY born c1855, died before 1911. 1.1.3.7. Maria PICKERING baptised 19 June 1856 Great Driffield. 1.1.3.8. Martha PICKERING baptised 25 August 1861 Great Driffield. 1.1.3.9. Joseph PICKERING boot repairer, baptised 29 November 1863 Great Driffield, married 1884 Driffield Annie BRIGGS born c1864 Wansford. 1.1.3.10. Elizabeth PICKERING baptised 1 May 1867 Great Driffield. 1.1.4.1. Joseph Acklam PICKERING shoemaker, baptised 29 December 1842 Great Driffield, married 1st 1868 Bridlington Elizabeth HORNBY born c1848 Seaton, married 2nd Mary A. UNKNOWN born c1845 Hull, married 3rd Amelia UNKNOWN born c1853 Hull. 1.1.3.2.1. Charles Jennison PICKERING baptised 28 July 1865 Great Driffield, died wapentake of Buckrose 1950. 1.1.3.6.1. Martha Ann PICKERING born 1888 Driffield. 1.1.3.9.1. Clara PICKERING born 1885 Driffield. 1.1.3.9.2. Frederick PICKERING born 1887 Driffield. 1.1.3.9.3. Joseph Lloyd PICKERING born 1897 Driffield.